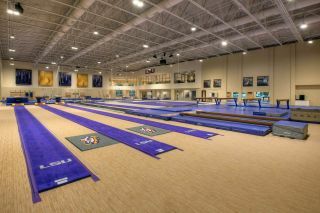 The new Louisiana State University gymnastics training facility in Baton Rouge, LA incorporates the latest training technologies and infrastructure with the latest in sound reinforcement and playback technologies. Although much of its 38,000 square feet is devoted to office space and support for the gymnastics program, nearly half is reserved for a comprehensive gym area that, despite no physical walls, is effectively divided into four separate audio spaces. Users at LSU can easily operate the system from Crestron control panels driven by Ashly Audio Protea DSP, with power provided by high-fidelity, workhorse Ashly Audio KLR-series amplifiers. Baton Rouge AV integration firm Sound-Advice USA designed and installed the sound reinforcement system at LSU’s gymnastics training facility. “The gymnastics program at LSU wanted a system that could accommodate many inputs across many zones, which required Ashly’s customizable control and its ability to work well with the Crestron interfaces that they wanted,” explained Richard Hale, founder and president of Sound-Advice USA.